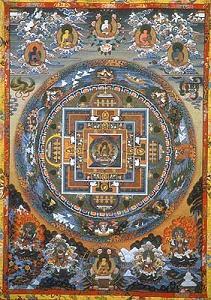 Buddhist mandalas are sacred representations of the universe, and are used in meditation, rituals and architecture. They are primarily associated with Tibetan Vajrayana Buddhism, but other Buddhist branches also use them. The Japanese branch of Vajrayana Buddhism, Shingon, has its own mandala styles, and some schools of Nichiren Buddhism venerate a mandala specific to them called the moji-mandala. Although Theravada Buddhism is not known for the use of mandalas, some branches do build stupas, a mound-like structure used to mark a sacred place, and the geometric patterns within these mirror those of mandalas. Mandalas make extensive use of sacred geometry and symbolism. Sacred geometry is present in the art and architecture of many religions, including in the floor, wall and window patterns of some Catholic cathedrals, Islamic mosques, and Jewish synagogues. Visual mandalas are also used in yogic branches of Hinduism as meditative aids. The philosophy behind sacred geometry is that the symmetry, balance, and relationships of basic geometric shapes mirror the cosmology of the universe. In the case of Tibetan Buddhism, each mandala represents a sacred space, and a pure expression of a particular Buddha's enlightenment, including the states of awareness most closely associated with that Buddha, such as compassion, bliss, or wisdom. Meditating on a mandala provides a way for a practitioner to 'enter' that sacred space, and experience those enlightened states of awareness, on the path to his or her own enlightenment. Within samsara, or delusional existence, mandalas serve as a doorway for practitioners into these realms of enlightenment. Several different geometric patterns appear in Tibetan mandalas, comprised mostly of circles and squares, but triangles are also incorporated. A dot at the center of a mandala represents the center of the universe, a reality beyond the confines of time and space, subject or object. 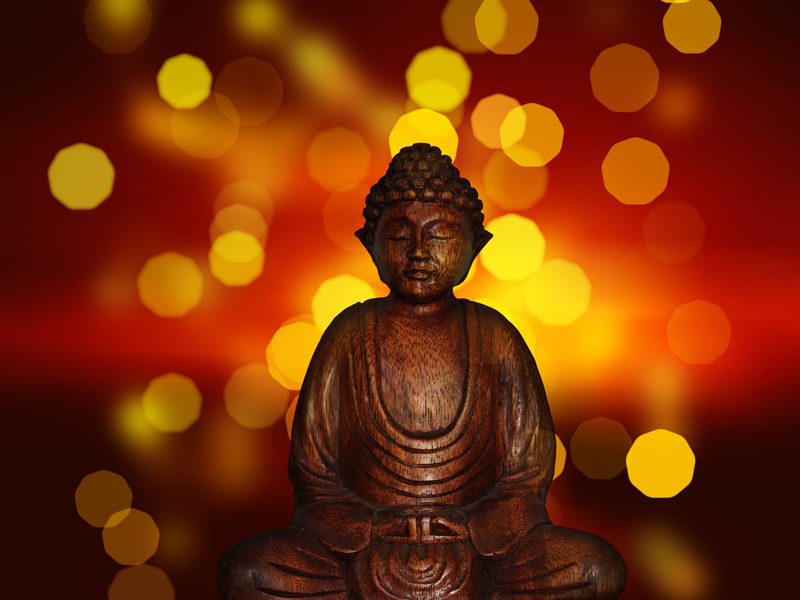 If the mandala has a Buddha associated with it (as most, but not all, do) it is placed on top of this dot. This Buddha (which might be a man or a woman, as both exist within the Tibetan tradition) is typically surrounded by a series of squares, representing many things, including the four directions of the physical world (north, south, east, west) and the four brahmaviharas or 'boundless states' of loving-kindness, compassion, sympathetic joy, and equanimity. These squares are usually surrounded by a series of circles, including a circle of fire that represents the challenges and transformations a practitioner must undergo on the pathway to enlightenment. Constructing a mandala is considered a sacred practice, and requires years of training. Specific rules and rituals govern their creation, and each step in the process is itself considered a Buddhist teaching. In the case of sand mandalas, which are giant mandalas usually created together by four monks, the process can take weeks. While painted mandalas are often hung in monasteries and used for meditative practice, sand mandalas are destroyed with the swipe of a hand upon their construction. The act is itself a meditation on impermanence and detachment.